Witch Crime #4: Anne Boleyn was presented as a seductress by her early suitor, Sir Thomas Wyatt. Wyatt is thought to be describing his own romantic pursuit of Mistress Anne, in direct competition with the reigning “Caesar” (King Henry). With his characteristic play on words he presents “an (Anne) hind (deer)” – “Dear Anne” as their beautiful prey. But as Karen Lindsey points out, “everyone knew what happened to the wild creature at the hunt’s end”(59) – it was captured, possessed, and destroyed. Further, by alluding to the ingrained imagery from the Malleus Maleficarum, Wyatt’s line, “Sithens in a net I seek to hold the wind” unfortunately conjured up the witches described by the two Catholic Inquisitors: “Their face is like a burning wind . . . and when it is said that her heart is a net, it speaks of the inscrutable malice which reigns in their hearts” (46). 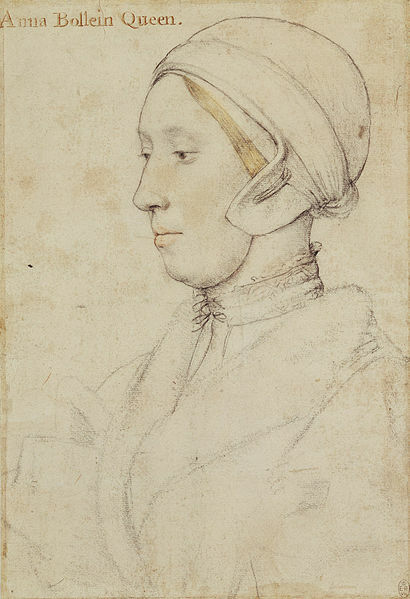 Yet while Wyatt’s word-choice was most likely an unconscious literary device intended to portray the beloved as an illusive free spirit, his subliminal portrayal of Anne as a wild woman was not in her best interests, especially when the courtiers familiar with the Malleus, who had access to his early manuscript poems, were most likely the same men who sat at her trial. The pretty doe of the hunt soon turned into a dangerously seductive temptress. Again, not intentionally associating his “answer” (Anne, sir) with witch craft, the poet’s ambiguous phrasing lends itself to a potentially sinister interpretation. For although both the “causer of my pain” and “my sore” are common terms from the Courtly Tradition, they are also reminders of the Inquisitor’s warning that, “a woman is beautiful to look upon, contaminating to touch, and deadly to keep” (46), and one of her many “injuries towards men” is the agony of “bewitching into an inordinate love”(47). 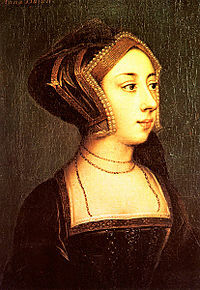 Wyatt’s poems stand in acknowledgement of Anne Boleyn’s seductive powers. They may further have reminded her enemies of the old Queen Catherine because of this statement from the Malleus: “. . . how many adulterers have put away the most beautiful wives to lust after the vilest of women!” (51). Blinded with the stroke, erring here and there. The pain of my fall patiently bearing. It is thought that “The lively sparks” may be a reference to Anne Boleyn’s “striking and unusual” dark eyes (Chapman, 21). The second line, “Against the which (witch) ne vaileth no defence,” suggests that the lover has no protection against the sorceress, and the phrase, “Have pressed mine heart ” recalls one of the punishments dealt to witches when their bodies are “pressed” under heavy stones to extract a confession. The speaker of the poem is “ystricken with dint of lightning” as if falling under a spell, and though he should say “Nay”(No), her power over him is too strong to resist. Ironically, this young man’s heart-felt love poems may have helped pave the way for his sweetheart’s execution. It is doubtful if any of the Queen’s friends actually believed she was a witch. And though she was condemned for treason and adultery, her own conscience was apparently clear. Shortly before her death Anne told her jailor that she “would be a saint in Heaven, because I have done many good deeds in my days” (Lindsey, 100). But unfortunately, over the centuries, Wyatt’s damning words have reached far more ears than her last cry of innocence.